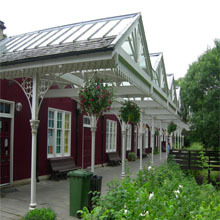 The museum is located in Strathpeffer's charming old Victorian Station where trains brough visitors in the village's heyday as a spa. The museum tells the story of childhood in the Highlands of Scotland, recording tales of childhood amongst hardworking crofters and townsfolk, where money and luxuries were scare and life followed the satisfying rhythm of the seasons. The museum is home to the comprehensive Angela Kellie Doll Collection, costumes and childhood treasures from the past 200 years. 1st April - 31st October - Monday to Saturday 10am - 5pm. Sunday 2pm - 5pm.